First of all just wanted to say this forum has been extremely helpful for me. Is it possible to self study Level II or should I attend classes? In Hong Kong, most people I know who have done or attempted the CFA exams use the Schweser books/classes. If I were to self study, would you guys recommend Schwser or other resources (undestand there are pros and cons to the different resources)? If I were to use the Schweser books, how would you recommend I supplement this? Last time around I used the Schweser books but also wished that there were resources I could listen to or watch on the go on my phone. I did the CFA Level I (studied full time for 6 months) 6 years ago, before I embarked on my career as an M&A lawyer. Due to a change in circumstances and the fact that I now get off work at decent hours, I am considering doing CFA Level II for personal interest/challenge and also to better ‘speak the lingo’ when communicating with the business professionals in my line of work. 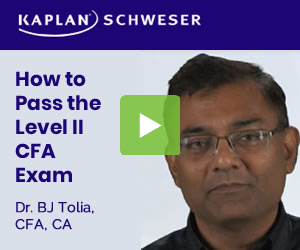 My only formal training in accounting/finance/economics was studying the CFA Level I. I planned to self study Level I but after spending a month with and struggling with the Schweser books I realized I needed more help and enrolled in the Kaplan Level I courses (really helped to have someone explain concepts/calculations and to have someone answer questions). I found level 1 quite challenging and felt extremely mathematically challenged (I know Level I was v. easy for most of you and the maths in Level II will be much harder). I probably spent more than 300 hours preparing for Level 1 but it was worth it - I passed on first try, with all 7 topics 70% or above, 3 topics 51-70% and no topics below 50%. Go with IFT videos. I am also using it with Schweser book. What do people think about MM +Schweser as a L2 strategy? Just thinking ahead, has people used MM for both L2 and L3? If so is it worth getting the one fee to completion, or to separately use MM’s L2 and L3 courses? I ask this because it seems like the majority of people recommend LevelUp for L3.